This blog has originally been posted on ircwash.org. The tools mentioned in the blog are accessible from the original post. Using real data, we look at how the WASHCost calculator can be used in practice in India. This is a depiction of how someone can use the advanced tool of the WASHCost Calculator. The example input data come from the real dataset collected by the WASHCost project in India (see link below). Ravi Kumar, Junior Engineer working at the Block level is concerned about maintaining the Open Defecation Free (ODF) status awarded to Venkatapuram. He wants to know if households and government are spending enough on sanitation services to maintain this status and to have a sanitation service report on finance that he can share with stakeholders. Ravi starts by providing some contextual information about the village, its location, the population density and who is responsible for the various aspects of sanitation services. Households take care of most aspects of their facilities and the maintenance of the sanitation service. 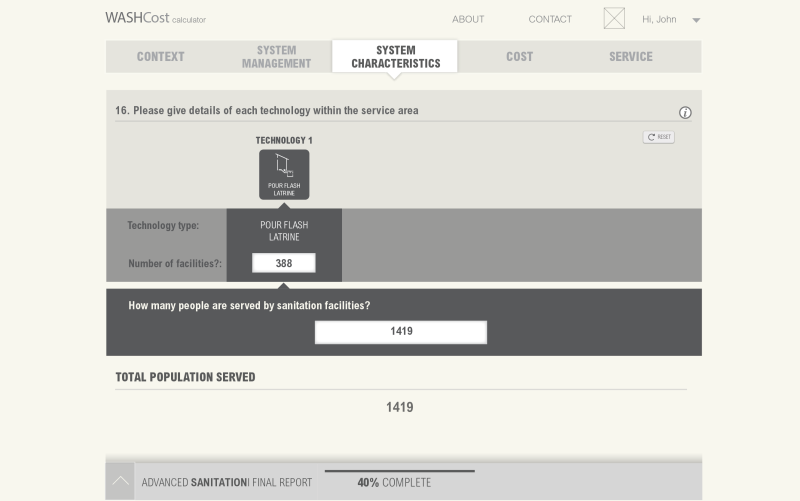 Adding this information to the WASHCost Calculator report page will help Ravi communicate the financial sustainability of sanitation services. The data also includes some information about household income and size. Several technologies can be defined in a service area in the tool. Venkatapuram has only one type of latrine. The junior engineer uses the technology screen to start to define the technologies used. First, by selecting the Pour Flush Latrine. Some additional details can be filled in to differentiate between pour flush latrines. In this example, the latrines share the same characteristics. For example, there were no double pit latrines. The junior engineer knows that in total, ₹ 3,015,342 was spent on constructing latrines in Venkatapuram. Unfortunately, he does not know what was spent on software costs. Ravi made educated guesses about the lifespans of each component. From WASHCost, Ravi knows what the households are spending each year on operation and minor maintenance of their facilities, e.g. cleaning and materials. However, he does not how much households have spent to empty the pits, how often that happens and is not aware of any loans that have been taken out to construct the facilities. In the tool, Ravi can divide them up the households by the level of service that they are receiving. The WASHCost Calculator allows different types of households services by their accessibility, use, reliability (maintenance), and environmental protection. Ravi has data for all of these except environmental protection. 71% have achieved a good level of service but the difference is not everyone in the household uses the latrine and 8% of households have no household level toilet so cannot be considered to have access to a sanitation service. Ravi inputs each of these into the WASHCost Calculator service level screen. At this point, Junior Engineer Ravi Kumar can generate a report including a financial analysis of Venkatapuram based on the data he entered in the calculator. Ravi is concerned about maintaining the Open Defecation Free (ODF) status awarded to Venkatapuram and wants to know if households and government are spending enough on sanitation services. Upon finishing the inputs, Ravi generates a nicely formatted report that can be shared with stakeholders. The report provides a quick overview that Ravi can discuss with stakeholders first. He can bring up issues like missing data and try to fill in the gaps. In addition, over the long term, affordability may be an issue (more on this later). Finally, the junior engineer also has the chance to say what exactly the town has achieved in terms of service levels and at what cost. Total expenditure over 30 years is ₹ 6,269,328 according to inputs on capital expenditure and recurrent expenditure. However, there is a potential recurrent expenditure shortfall of ₹ 308 per person per year or approximately ₹ 0.84 per person per day (about US$ .02 / person /day) based on your capital expenditure and a comparison with the WASHCost benchmarks on minor operation and maintenance, capital maintenance and direct support. There may be some risk to affordability, especially for poorer households. In addition, some households do not have facilities and this will incur capital expenditure on new facilities to provide households sanitation services. Missing data on software costs and capital maintenance expenditure may be affecting the results. 14% of areas outside of Venkatapuram inputted in the tool spend less on investment (capital expenditure on hardware and software) according to other data in the tool. 33% of areas outside of Venkatapuram inputted in the tool spend less on recurrent expenditure according to other data in the WASHCost Calculator. 92% of the population receives a basic sanitation service that meets national norms. Only 5% of other service areas have a more people with access to a basic service according to data in the WASHCost Calculator. However, 8% of the population have no household level sanitation service. The potential expenditure shortfall may put these services at risk. In this section, Ravi gets an overview of the financial analysis. Based on inputs, the cost of establishing facilities and services is ₹ 3,015,342. The cost of maintaining those services over 30 years is ₹ 3,253,986 according to the inputted expenditure. However, estimated costs indicate that this too low. The graph below shows costs estimated over 30 years. The minor operation and minor maintenance expenditure and expenditure on direct support are taken from the WASHCost benchmarks. The capital maintenance expenditure is based on the inputted capital expenditure and the lifespans of your facilities. When the life of a component comes to an end, it must be replaced and incurs a cost. There is an estimated potential shortfall of ₹ 307.93 per person per year based on a comparison with the WASHCost benchmarks and your capital expenditure. Missing data on software costs and capital expenditure may be affecting the results. Based on the inputted values, the current level of expenditure appears to be affordable to households. However, based on the estimated level of expenditure over 30 years, there is some risk to affordability. The total costs to finance operational expenditure, capital maintenance expenditure and the costs of capital equates to 0.4% of household income according to inputs. This is considered to be affordable. It could be that the poorest households will still spend more than 2% of their income, which would be considered unaffordable. The official could try changing the income value to test the affordability for poorer households instead. This check assumes the households will be paying directly or through tariffs for the operation, capital maintenance, and costs of capital of the facilities. The table below summarises the service level by indicator. 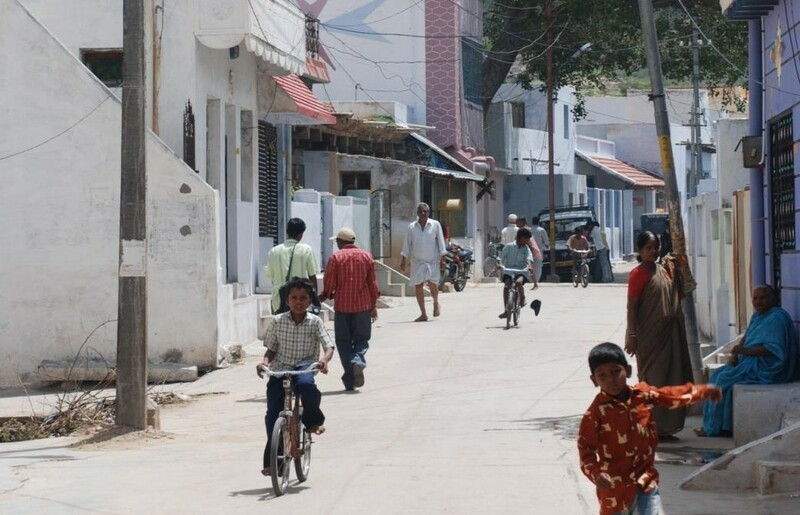 Go to the Panchayat and Venkatapuram to discuss strategies, both financial and otherwise, to address the slippage in service levels and potential financial issues. 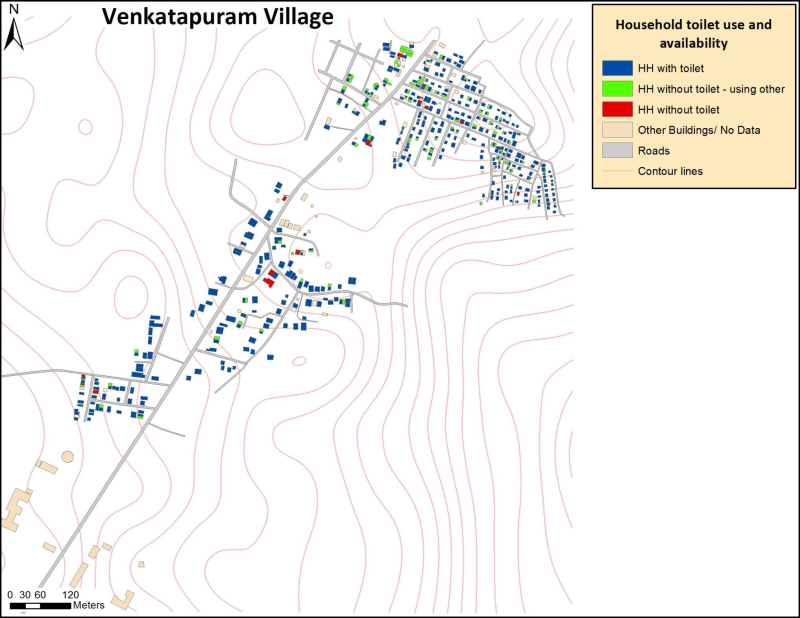 Use the tool to track progress over time and compare the results to other habitations in Andhra Pradesh. Connect the tool to a government database to improve the access to results. Encourage others to fill in reports on other habitations so that the comparisons become more relevant and there is more data available on sustainable sanitation services and how much they cost. Improve the reliability of the data by adding and changing values as better information is available and track the changes. Fill in different income figures to get a sense of risk to affordability. A significant number of households will earn as little as 5 times less than the average. This means there are some households for which sustainable sanitation is very expensive. Try the WASHCost Share tool!